Summer time for me is the season for fresh local fruit and ... wildflowers! Since this is a group devoted to the study of our local flora, I am confident that there are others who share my excitement about taking a hike to a new section of the woods in the cool of the morning hours and discovering yet another new wildflower. I get a sense of satisfaction from making a new notation in my Newcomb’s for that new wildflower sighting. Lately, I have taken on the task of identifying butterflies in our area - great spangled fritillaries, little wood satyrs, orange sulfurs, etc. Unlike wildflowers, the challenge with identifying butterflies is that they just won’t stay still for this curious naturalist, which usually results in a chase. Anyway, wildflowers, especially ones in sunny areas, are generally aflutter with butterflies, each busily probing its host plant with its proboscis, or mouthpart, seeking nectar. So, to fully appreciate our wildflowers, it is prudent to learn who their pollinators are. 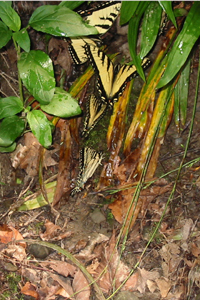 Butterflies are among the many flying insects that happily take on this job. Next time you are out hunting for that elusive wildflower, take the time to see who is fluttering in the neighborhood. Remember, wildflowers do not occur in isolation, but are part of a larger interconnecting ecosystem, in which they form a vital link. Without butterflies, there would be no spreading dogbane, and vice versa. Confined N.Y. females refused to oviposit on Spreading Dogbane (Apocynum androsaemifolium, Apocynaceae), nor would larvae eat it. Literature reports of this plant as a Monarch larval host may be misidentifications, since dogbanes also contain milky latex and superficially resemble slender milkweeds. 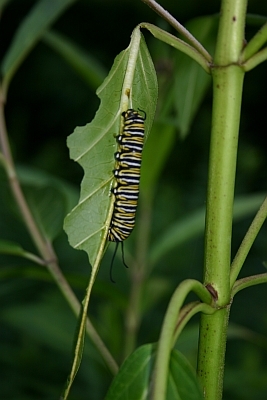 I have never found a wild larva on either Spreading Dogbane or Indian Hemp. Female Monarchs also would not lay eggs on local Vincetoxicum/Cynanchum species, and larvae wouldn't eat them. In the Northeast, they seem to be confined to milkweed hosts (Asclepias)."